Someone asked me about what kind of festival strategy you should have once you have a short film in the can, so here are a few thoughts on that very subject. 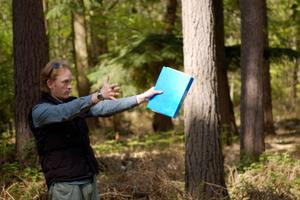 But first, here's a photo of me directing a few trees on the set of my award-winning short film Origin. Look how I get them inspired to act! You can never start too early with a festival strategy. It helps to know what kind of festivals you have in mind while you're prepping the script, never mind post-production. 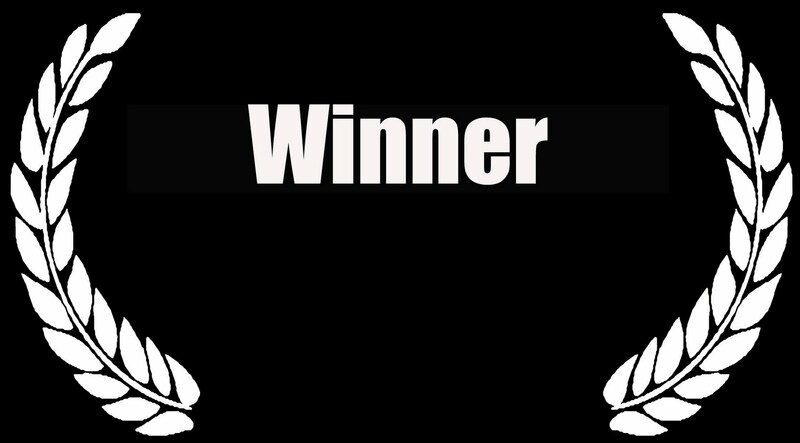 So, the first consideration is: what type of film is my short? Of course, we all think our films are great, or will be great, but the answer needs to come with cold perspective and slicing honesty. For example, is it, or will it be, a perfectly well-made short that's decent and presentable but not particularly original/distinctive with its idea, story or execution (the majority of short films). If a short falls into that category, then you can plan to go far and wide with the festival submission, load up your details on Withoutabox and cry as your credit card gets stung as quickly as a swarm of a thousand bees pouncing on your sensitive skin. If you've got a short that you genuinely, GENUINELY, think is something special, then you can plan to be a bit more ambitious. For example, hold out for the BIG festivals that only accept a short if it receives its world premiere at its festival, like Cannes (NOT Short Film Corner, any schlub can upload a film there), Edinburgh (although I think their premiere rules have changed), Sundance (who, surprisingly, don't have premiere rules, but they are big) etc. The downside of this is WAITING for these festivals to come around (you could have your film ready, essentially doing nothing while you wait for the likely rejection), and you've wasted valuable time in your short film's festival lifespan (typically around 18 months after your film is finished). Most filmmakers think they have a short film that falls somewhere between the first category (a decent short) and the latter category (this will win an Oscar!!). This pushes you to submit to the bigger festivals but also hit the well-established (Raindance, London Short Film Festival etc). A lot of filmmakers get disappointed and disillusioned when they can't get in to any of these (competition is FIERCE with a capital FIERCE), and end up having to be content by getting into some local film festival being held by a bunch of students in a barn. It's good to be ambitious with submitting your short to big festivals, especially if you really believe in your film, but be realistic, and go for the well-established and boutique festivals (lots of smaller but well-respected festivals around, like Brancharge and Berlin British Shorts). It all depends on how much budget you have for festival submission, and if your strategy matches your funds. Sending it to the big festivals, and as many as you can find, will cost a lot of money; not to mention the DVD duplication and promotional materials. Try to allocate a budget now so you know you have the money to go for the festivals you want, when the time comes. The submission/acceptance ratio goes something like 1 festival entry to 6 festival rejections. So that's a slog of seven submissions before you get into just one! And the cycle continues! 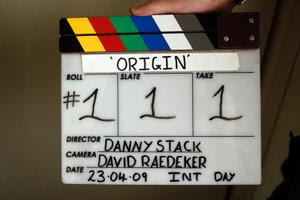 For Origin, I had such a nightmare trying to finish the film that it sucked up all my resources. When it came to festival submission, I could only afford a good handful, and naturally I went for the big ones. I took a chance and submitted it to other festivals, and I thought whatever festival came first got the premiere (which was at Brancharge). I would have loved to have had wider festival exposure but I simply ran out of funds and energy (festival submission is exhausting and demoralising). On the plus side, there are well-respected festivals that are FREE to enter, so that's good, but a bit hit and miss. While getting your film into a festival is exciting and a great boost of confidence, the actual experience of the festival can be quite flat and disappointing, as the audience is either full of the other short filmmakers in your line-up, or worse, the screening is barely attended. But if your film gets nominated or wins something, then that's the real kicker to help promote your film to execs and the industry at large. For much more information, check out Film Festival Secrets. There's also a great download from Scottish Screen called 'I've Made a Short, Now What?' and Chris Jones has an excellent online seminar, which is very practical and inspirational (I did it before I started Origin). Also, the British Council help short filmmakers by submitting the film to various festivals on your behalf. Of course, you have to apply, and they're quite picky, but the festivals they have lined-up usually qualify for BAFTA and Oscar consideration, so it's well worth a punt. If the British Council say no, you can always apply to the BAFTA/Oscar-credited festivals yourself, which is what you'll probably be doing anyway because, well, your film is special, right? Sorry Danny but I thought the trees were the weak link in Origin. Such prima donnas on set, too. I've created an online, interactive short film festival that should get your short film in front of an engaged audience. Free submissions are closing in the next day.